A HUGE 6.3-magnitude earthquake struck off the coast of Oregon on America’s West Coast today. The shake followed an intense week of seismic activity in which the deadly Ring of Fire was rocked by 70 quakes in just 48 hours. A cluster of 16 “significant” movements, all above magnitude 4.5, hit on Monday following 53 that shook the region along the disaster zone on Sunday. The US Geological Survey reported that Tuesday’s quake had a depth of 76 miles (123 kilometers) and its epicenter was about 12 miles (20 kilometers) northwest of the Venezuelan city of Yaguaraparo. Jesus listed earthquakes as one of the signs that precede the Great Tribulation (Matthew 24:4-21; see also When Will the Great Tribulation Begin?) and told His followers to watch. Officially, in the 21st century, a “great earthquake” is 8.0 or higher on the Richter scale and can totally destroy communities at its epicenter. Places in the USA to watch which have massive danger potential include the New Madrid Fault, Yellowstone, Cascadia Subduction Zone, and the San Andreas Fault. 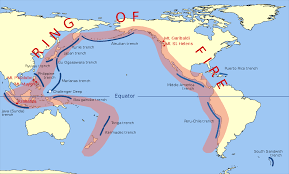 Of course, anywhere around the Pacific Ocean, which is sometimes called the Pacific Rim of Fire, is at risk. As are places like Iceland, the Middle East, Europe, Asia, the South Pacific, Australia, and even parts of Africa. As well as places in Latin America and the Caribbean, as the quake in Venezuela shows. Yet, since Jesus mentioned earthquakes in diverse places, places people do not consider to be subject to earthquakes are also at major risk. Notice that the above earthquake is so big that the cities of the nations will fall. Mountains will be leveled and islands “fled away” (more on this can be found in the article Islands and Bible Prophecy). This seems to be the biggest earthquake that will ever hit the planet with humans on it. Despite the view of ‘preterists’ that this already happened (see The Dangerous Rise of Preterists), that is nonsense. The earthquake of Revelation 16 will be bigger than what the usual “experts” have believed was possible. It will change the planet and humble parts of humanity. If you survive you will be affected. If you live near water or on an island, you will face terrors beyond what many have considered possible. 11 And there will be great earthquakes in various places, and famines and pestilences; and there will be fearful sights and great signs from heaven… 25 And there will be signs in the sun, in the moon, and in the stars; and on the earth distress of nations, with perplexity, the sea and the waves roaring; 26 men’s hearts failing them from fear and the expectation of those things which are coming on the earth, for the powers of heaven will be shaken. 27 Then they will see the Son of Man coming in a cloud with power and great glory (Luke 21:11, 25-27). Essentially, the Bible shows that there will be the greatest earthquake of all time that will level mountains, and this will be followed by the sea and the waves roaring. And if most of the frozen waters have melted by then, the height of these roaring waves apparently will be enough to destroy most who live on islands. According to the Bible, these prophesies are certain to come to pass (Revelation 22:6). Even those who do not live near water or mountains will be affected. Modern conveniences will be disrupted and it will not be good. Watch, pray, and change your life so that you may be counted worthy to escape all these things that will come to pass, and to stand before the Son of Man. 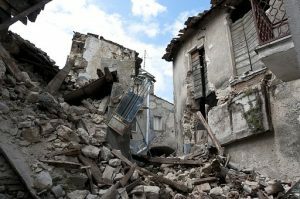 Earthquakes Today and Bible Prophecy This article goes over facts about earthquakes. It also explains what Jesus taught about earthquakes and how the Bible describes “the big one” (as well as when it is expected). Islands and Bible Prophecy What’s ahead for islands? What does the Bible prophesy about them? Christian Repentance Do you know what repentance is? Is it really necessary for salvation? A related sermon is also available titled: Real Christian Repentance. Is God Calling You? This booklet discusses topics including calling, election, and selection. If God is calling you, how will you respond? Weather Blessings and Sorrows Are weather problems a warning? What should be done? Here is a related YouTube video Does God Use Weather? Does God Have a 6,000 Year Plan? What Year Does the 6,000 Years End? Was a 6000 year time allowed for humans to rule followed by a literal thousand year reign of Christ on Earth taught by the early Christians? Does God have 7,000 year plan? What year may the six thousand years of human rule end? When will Jesus return? 2027 or 20xx? There is also a video titled 6000 Years: When will God’s Kingdom Come? Here is a link to the article in Spanish: ¿Tiene Dios un plan de 6,000 años? This entry was posted on Wednesday, August 22nd, 2018 at 7:00 am	and is filed under Prophecy.